Thank you so much for being president. I thought for awhile that I might have to do the job, but since nobody would ever vote for a person who promises "jobs for everyone, better education, and a few goats in the backyard," it's probably best that you took it and not me. I know that you get many, many letters a day from people telling you what to do, telling you how good or bad you are, wanting you to sign up for new satellite TV service at great introductory low prices -- but that's not why I'm writing. I would like to talk to you today about Health Care. Anyways, like I said, I don't know much about Health Care, but it seems to me that since our government is for the people and by the people, then the government should do something to make sure we the people can afford the price of being sick, in order to form a more better Union without a whole lot of sniffles. No. 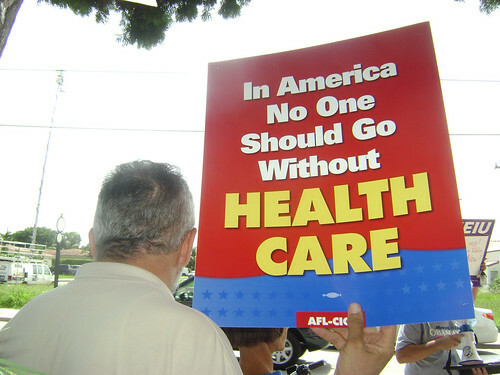 1 -- Health Care should be the right of every citizen, and not just a luxury. My Aunt Edna from El Paso always used to say, "I can't afford to get sick." But then she died, and now it's a moot point. But at least she did have a point. A lot of us can't afford to get sick. So, we need a change. I don't know what kind, but we need it. and No. 2 -- Health Insurers should not be able to drop our coverage just because we get sick. I mean, what's the use of having health insurance if they give you the punt because of something you can't control? Doesn't that sound a little mafia to you? "Hey, want to stay well? You better pay. But if you get sick and need a new kidney, then sorry Charlie, you're on your own!" I know, Health Care for everyone sounds like a wild and farfetched idea (my own family thinks I'm nuts), but I think a new way of thinking about our health is exactly what this country needs. Anyways, I hope you got some good ideas from this letter and will at least give it some thought. Health Care for everyone may be a dream, but at least dreaming about it is much better than having a nightmare about going to work without your pants on -- again. Thanks for your time, and now I've got to start working on that song. I think it could be a hit!